I think my dog is beautiful. (Just as beautiful as her puppy days!) She watches me with that blue eye, never taking her eyes off me as I do things around the yard. I was trying to get some decent shots of baby lemons from my lemon tree this morning, but I wasn't satisfied. I looked at her and thought maybe today she'd let me get a good shot of her. She is a dog who loves toys, and tears through most of them. We have only a handful of super-tough squeaky, bouncy toys that our dogs have not demolished. This little piggy is not a durable rubber dog toy. In fact, she could tear through that rubber in seconds if she wished. But for some reason she doesn't. She doesn't treat it like her other toys. It's almost like a baby. She carries it around in her mouth, sometimes for half an hour or more without dropping it. She doesn't play tug-of-war with it. She doesn't bite on it. She sits with it, and I think that's precious. 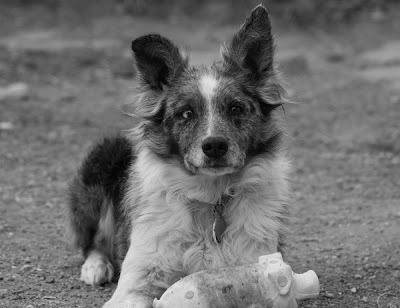 She let me photograph her with Piggy today.